Vivek Bhattacharjee is the 21-year-old owner of gym apparel brand Legacy Apparel – and he has big plans for transforming the business into a global brand. 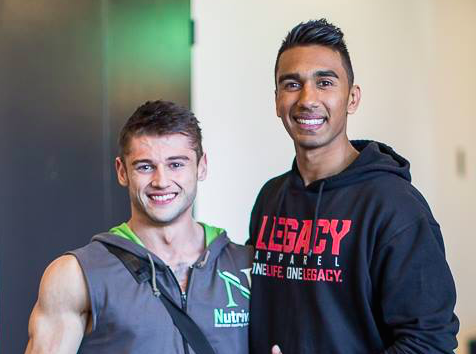 Vivek (pictured above, right) purchased supplements brand Legacy Nutrition from a friend last year. After initial research revealed that the supplements market was already saturated, he decided to focus on selling Legacy branded gym apparel and clothing. He contacted manufacturers overseas, placed his first Legacy Apparel t-shirt order and sold them to friends from the boot of his car – often making deliveries in person to thank customers for their orders. He developed relationships with local gyms, including Elite Physique’s Billy Giampaolo, who offered to trial the Legacy Apparel range in his Phillip gym for three months. Twelve months later, Legacy Apparel is stocked at eleven gyms across Australia, and runs of 150 or more t-shirts regularly sell out in less than a fortnight. All online orders are currently placed via Legacy Apparel’s Facebook page, and demand is likely to increase further when it launches its website in coming weeks.